The fourth of July is my favorite holiday because of fireworks! I grew up in Lousiville, Kentucky and they have this event called Thunder Over Lousiville. It’s the kick-off event for the Kentucky Derby Festival. It is one of the nation’s largest annual fireworks extravaganzas. Since the first time seeing it, I have been obsessed with fireworks so learning to photograph them was a must for me. Here are are some easy tips to get you started before the big holiday arrives. Set your camera on a tripod. Turn your camera to manual. Set your ISO to 100 or 200. You won’t need a high ISO since your subject is so bright. Set your aperture between f/8 – f/16. Keep in mind fireworks are huge and you want to have enough depth of field to have sparks from the front and back in focus. Set your lens to manual focus and turn the focus ring to infinity. Then back it up just a little bit. Your shot will be sharpest if you are focusing just shy of infinity. Turn off Noise Reduction. Even though you’re shooting long exposures it may take the camera several seconds to a minute to be ready for the next shot. Which means you could miss fireworks while your camera is processing your last image. Turn off the Vibration Reduction or Image Stabilization in the lens you use. Because your camera is on a tripod, you don’t need this feature turned on. Generally, when left on while the camera is doing long exposures on a tripod, it actually causes a little bit of image shake. For shutter speed, you’ll have the most flexibility if you shoot on Bulb. This setting keeps the shutter open for as long as you are pressing the button. This means you can start the exposure when you see the firework rocketing into the air, and end the exposure just after it hits its peak (or whenever you feel like it!). The longer the shutter is open, the more of the firework you’ll see. You can set your shutter to a particular speed. I like 15 seconds or 30 seconds. But different sets of fireworks will have different ideal lengths for exposure. Bulb gives you the instant flexibility to decide exactly when and how much fireworks to have in your shot. Also, it is easier to use Bulb if you have a release or wireless remote trigger. Rather than pushing the shutter button on your camera and causing it to shake on the tripod each time, you can use a cable release to trigger the shutter without touching your camera at all. That way you have zero shake from touching your camera and the best chance at a sharp exposure. Remember practice makes perfect. Buy your kids a pack of sparklers. Give them 1 or 2 for a few nights before the big show. 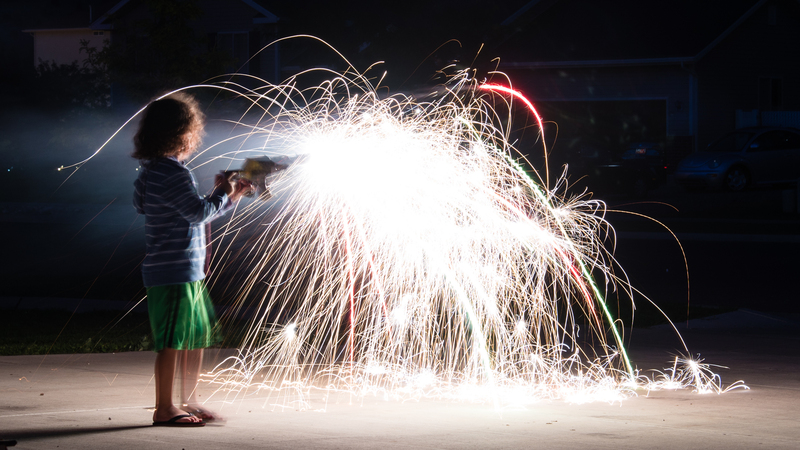 Sparklers are great practice and the kids will love it. Once they see their photos they will just think you are the coolest! Go around to the neighboring town’s fireworks shows just to practice. Try all the settings ahead of time to see what you like best. That way the night of the big show you can sit back and relax while your camera does all the work.